Playing the music inside is what is important…from the place of silence. The illusive sound of shakuhachi…well there are so many. I tell my students that 100 different timbres are needed at least…don’t throw out any sound as imperfect. All the sounds have their place in a piece you give to others. All sounds are part of the language of expressing the inner landscape. If you get to the illusive sound, that is great and necessary, but simpler sounds are also necessary to showcase the illusive ones. I like the Yuu Shakuhachi very much. I like the quality of this flute for the price. I would be happy to write a testimonial for the Yuu Shakuhachi. I think they are the best thing that’s ever happened for shakuhachi beginners in the USA. Financially and qualitatively they can’t be beat. There is nothing else close out there for the price. 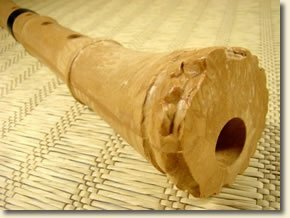 I recommend the Shakuhachi Yuu to anyone starting shakuhachi. It’s in tune, virtually indestructible, and inexpensive. But most importantly, it sounds really good. I am always relieved when a new student has a Yuu—I don’t have to worry about their instrument, just their playing! What a surprising instrument is the Yuu Shakuhachi. Robust plastic, molded into the form of a bamboo root-end, it certainly looks the part. But the most pleasing aspect is the tremendous sound; so clear and responsive. I would have no hesitation in using the Shakuhachi Yuu in a performance at any level. It is a must for beginners, and at such a reasonable price, and as a “second” flute for experienced shakuhachi players, professionals and teachers. The Yuu shakuhachi offers a very affordable and decent flute that is adequate both for beginners, as a basic entry level flute, as well as more advanced players who are seeking a flute to take to the beach or to the woods or to the desert. The Shakuhachi Yuu is the finest inexpensive flute available at the present time. I am a professional musician and I teach shakuhachi in Montréal. I endorse the Shakuhachi Yuu fully. It is a very good student instrument and great back-up for professional shakuhachi players. I also find your Shakuhachi Yuu very handy for a tough task—jazz clubs, outside concerts and cold weather! Recently I played the plastic Yuu Shakuhachi for the first time. And I am really impressed by it. This is an instrument that I can give to beginning students who do not yet have a shakuhachi of their own. Now they can experience how it feels to play a real shakuhachi, because this instrument is in many ways comparable with a good quality shakuhachi. The weight makes it feel like a genuine madake shakuhachi. Another very good quality for beginning students is that it is rather easy to produce a tone and the tone quality is strong and pure. And all this for a rather cheap price. As for myself, I am very glad to have found this instrument. Now I can take my shakuhachi wherever I want to go without having to be afraid it will be damaged. And also, now I can take a bath and play my own music…great! Shakuhachi isn’t for everyone, and it’s a shame when a beginner has to spend a fortune on a flute before they know for sure if this is what they want to do. With the Yuu shakuhachi the new student can get started without getting a second mortgage on their house! The Yuu has good volume and is not plastic sounding at all. The shape, weight, and balance gives it the feel of a traditional shakuhachi, so if and when one moves to a more expensive bamboo shakuhachi it will be a smooth transition. Since the Yuu Shakuhachi is easy to play and has a very pleasing sound, the beginner will be less frustrated and more likely to stick with it. I think the Yuu is perfect for students to learn the traditional shakuhachi repertoire on. I bought my Shakuhachi Yuu in order to have a second 1.8 shakuhachi that I could take with me anywhere without worry. I have been delighted to find that this shakuhachi responds not only with beautiful tone color and resonance, but accurate pitch as well. I love bringing it with me wherever I go and being able to work on my sound while away from home. I recommend the Yuu to both students and professionals. It is a serious instrument at a very affordable price. I am a professional musician and teacher. I play saxophones primarily and flutes as doubles. I own various wooden flutes, from bansuri to 19th century transverse flutes. For a shauhachi, I use a bamboo root end. I found the Yuu website and was intrigued by the price. I thought if it doesn’t play well then I could have a shakuhachi for a student or a nice conversation piece. I listened to the sound clip and was amazed at the sound. Is this for real? Well, I received the Yuu, I tried it, and could not put it down. Great tuning, sound and very playable! The balance across the scale is wonderful, no dead notes, everything rings. I did some recording dates on it and it sounded just like my bamboo root end, not better but on par I would say. I took the Yuu to demo at an Asian music class and students were shocked to find out that it was plastic! Since then I’ve stained and painted it to look like old bamboo and nobody can tell the differerence. I’m using the Yuu more than my other flutes for the simple reason that I now have a good flute that I can take along anywhere and not worry about damage. I have no problems with playing on plastic; my main concern is sound and the Yuu answers that need. This is amazing! I received the flute today…wow. I`ve been playing shakuhachi for nearly 15 years and have bought a lot of them, and never have I been so surprised by the tone, response and tuning. The Yuu is more in tune than my 70+ year old Kawase. It will be a great flute for everyday work, especially jazz and live music in sometimes weird conditions. Give my regards to the maker! Concerning the Shakuhachi Yuu, it is an exellent and robust meditation instrument with a moderate price and a good sound, which I also use for public performances. I am a professional artist and offer performances in the areas of meditative and experimental music. I have just received my Shakuhachi Yuu and I am very impressed. My friend and I did a sound test of three different 1.8 shakuhachi: the Yuu, a $500 bamboo flute, and a $2,000 bamboo flute. I played in the other room as he listened, then he played as I listened. Neither of us could reliably pick out the Yuu’s sound from the other two bamboo instruments—we were shocked. I will never stop loving bamboo for its dimensional character, but the Shakuhachi Yuu is a fantastic instrument. Thank you for making it happen! I honestly think that there is no finer instrument for one who wishes to begin this path! The freedom from worry about maintenance and durability combines with the affordable price to make the Shakuhachi Yuu an incomparable value. The more I play it, the more enchanted I am with it and the happier I am that I ordered this from you. I am convinced the Yuu will remain a faithful companion to me for decades yet ahead. I received the Shakuhachi Yuu today, it is so nice. I am a flute maker and I must say that anyone who does not own a Yuu because of the material it is made from needs to ask themselves why? The Yuu surpasses the sound of quite a few expensive shakuhachi I have played. The economical factors and the no worry ABS plastic makes this one of the best shakuhachi out there. I can finally go to the Florida coastline and play a quality shakuhachi without having any worry in my heart about my flute…my music will be unaffected and pure. I have received my shakuhachi today. Good instrument. Easy to play, good response and tuning. I will surely recommend it to my students and friends! Thanks for the good service! Many thanks for this wonderful flute. The tone colour, balance of sound and intonation are excellent. Incredible for the price! The Shakuhachi Yuu makes the third addition to my collection of shakuhachi. And after having had the chance to play it for awhile, I can unreservedly say that I am extremely happy with it. I have already recommended it to a friend as an excellent beginner’s flute. The Yuu plays just as well as my bamboo flutes and I don’t have to fuss or worry over it so much when going out to play in more rugged locations. In fact, I carry it with me a lot and break it out during spontaneous, inspired moments. I sincerely feel like having the Yuu has helped me to expand my abilities on the shakuhachi. I have to say that I am very happy with the Yuu. I was skeptical until another flute maker told me they had merit. I have used the Shakuhachi Yuu for several outdoor concerts in the park and I take it everywhere with me. The Yuu and my other 1.8 shakuhachi are seeing the sights of Kyoto and Nakajima. The quality of sound is quite good for the price. I have purchased flutes for hundreds of dollars more from established makers that were not half the quality. I would recommend this flute to the beginner or intermediate player and especially to the traveler who might worry about a more fragile bamboo flute. I am even using the Yuu as a backup on one of the tracks on my new CD. Thanks for the wonderful product. I received the shakuhachi today. Thank you, thank you! It is as good as you advertised it. The tuning is perfect, it plays easily and sounds great. I have been looking for such an instrument, but have not found anyone that sells one until I found your site. Best wishes for your prison dharma ministry. May many people in prison or out be freed from the prison of their mind. As a beginner to the Shakuhachi, I was a little confused over the many different types available and the large sums of many they can cost. After trying a reasonable quality bamboo 1.8, I discovered the Shakuhachi Yuu. Despite being cast in a plastic resin I found the flute really looks the part and is much easier to play than any bamboo flutes I have tried. The sound is authentic and I have felt more impulse to pick it up and try to play it! All round great idea; robust for travelling, easy to care for, and great sound. … got it within 1.5 days after shipping in perfect shape. Really like it and have been playing three hours a night since. My playing has come along amazingly since I’ve had it…very easy to play and sounds great. Thanks much! I received my Yuu yesterday and quickly found out that the Yuu is truly a most wonderful, quality musical instrument. I have read in books and on the internet, that getting a sound from the shakuhachi can be a daunting task for some. However, this was no problem for me, within minutes I got a sound from the Yuu and even later started playing some melodies on it. I can’t praise the Yuu highly enough. It has a quick response, superb tone and possesses that plaintive sound unique to the shakuhachi. And because it is practically indestructible I don’t have to worry it will crack when I take it with me on my summer vacation to play in nature. Thank you for bringing this incredible, affordable flute to shakuhachi fans worldwide, thus enabling beginners like myself to partake in the magick of this ultimate solo-instrument. This flute is fantastic. It is the best value for the money shakuhachi available in the UK – even when you factor in British import tax on musical instruments. You can quote me on this if you like. It is completely playable in all registers and compatible for formal study in traditional Japanese music. I am very happy with all aspects of it and will probably start decorating it with modeling paints to further enhance the bamboo look. I have been practicing the shakuhachi for several years now. I have found the Yuu flutes to be a wonderful alternative to taking a more expensive instrument with me, when I might otherwise feel it to be more prudent to leave my expensive model home and thus be flute-less. So whether I’m bouncing down the coral on my bike or hopping on an airplane, I have no hesitation to throw a flute in for those spontaneous desires that crop up to blow a little Ro. The Yuu flute has much sound I’ve yet to discover and is very durable. When I received my Yuu, I was not expecting anything very great. But the more I played it, the better it seemed. I am delighted with it. I think it is the best $86 I have ever spent in my life! My teacher also realized right away how good it is&mdashhe asked me to get two for him on the spot. About the Yuu Shakuhachi. It plays well, like a $1500 shakuhachi. It has the right weight, shape, feel, color, and pitch. The price is wonderful. As for the sound, it is clear and very bright, a very Western sound; I would say that it has a dense and compact character, thus making it clear and bright, optimistic maybe. Maybe this kind of sound is really what the world needs in these days of turmoil. For the money, perhaps it is the best flute to begin…a great way to begin and also very durable to take any place, even the desert for any level player. I think there is a definite difference in the timbre of the sound from the ABS pipe to the bamboo, which is more open, porous, and resonant, but there are many positive reasons to play the Yuu Shakuhachi as well. Playing it can be very satisfying. I am indeed quite pleased with the Yuu Shakuhachi. The quality of this instrument was so much better than I expected. This instrument is certainly great for beginners like me because you know that you are getting an instrument that is versatile, plays well and travels well. I really wanted to learn to play the shakuhachi, but was not ready to spend thousands of dollars to obtain a flute just to begin my learning. The Yuu is really a great instrument and quite affordable – a truly excellent choice for beginners and also for those who want to travel with their shakuhachi. Further, the New England climate can be quite extreme and dry at times, and I never have to worry about climate or weather damaging this flute. Thanks so much – I am quite pleased with the Yuu!